So once again, I’m on the road for a few days flying down to Dallas and I just realized something. Using Google’s Gmail VOIP service / aka Google Voice and the GoGo WiFi network, I can make free Phone calls from an Airplane 35000 feet up! In fact, I just did! Halfway through writing this groovyPost, it occurred to me I could demonstrate for myself the quality of the call. How? I called my wife’s Google Voice number and left a voicemail so I could embed it here for all you to listen to (don’t worry, I didn’t say anything gushy). Take a listen if you want to see how GMAIL VOIP Sounds from 35k feet up! Not bad considering all I had at the time was an Apple iPhone Headset. Ehh? 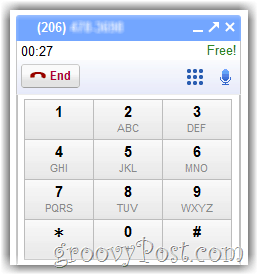 I just found that Google Voice is live in my country (India) and calls to all U.S. Numbers are free! Google Voice is not available in your country. Thanks for visiting Google Voice. We’re not yet open for users outside the US, but are planning to expand our service to additional countries in the future. It’s apparently a technical glitch. It stopped appearing on my Google Apps account and is now working on Gmail.